REVIEW: Kirsty Doull casts her eye over the Full Monty at His Majesty's Theatre. The rafters of His Majesty’s Theatre rang with roars of laughter from a very satisfied audience as The Full Monty strutted its stuff on the Aberdeen stage on Tuesday night. Those familiar with the hugely popular film of the same name will not be disappointed with its theatrical reincarnation. 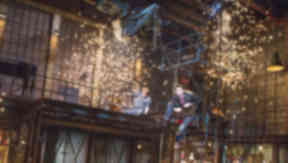 Adapted for the stage by the film’s writer, Simon Beaufoy, the play retains all of the charm of the film whilst adding many more delights for its live audience. The Full Monty does not follow the usual comedy rubric – its subject matter of unemployment and despair ought not to be amusing. However, with true British grit, the play delivers a sublimely hilarious tale that finds the humour in adversity as a group of unemployed steel workers attempt to become male strippers to make ends meet. The cast is led by Kenny Doughty as Gaz, the very definition of a loveable rogue, who has to make money fast in order to continue seeing his son Nathan, played on Tuesday by Travis Caddy. The audience broke into many spontaneous rounds of applause during last night’s show, not least of which for Doughty’s first attempt at a strip tease. Doughty has perhaps the most demanding role in the cast and his scenes with Caddy are extremely touching. Caddy is quite simply charming – and extremely funny – in the role of Nathan. The play’s strength is very much its terrific ensemble cast. Each actor brings their own comedic style to their role, and it is clear that their work with the playwright in developing their parts was time well spent, as each character is vividly real and likeable while still remaining side-splittingly funny. Of particular note is Roger Morlidge, who plays Gaz’s best friend Dave. His deft one-liners and moving scenes with his wife Jean, played expertly by Rachel Lumberg, are some of the highlights of the play. The part of Gerald was played by Simon Rouse, who is perhaps best known for playing Superintendent Jack Meadows in television police drama The Bill. Whilst also providing his own stand-out comic moments, Rouse also expertly conveyed the despair of the situation that the characters find themselves in and such poignant moments perfectly offset the riotous hilarity of the rest of the production. However, stealing the show is Craig Gazey as the bumbling and endearing Lomper. Best known for his role as Graeme Proctor in Coronation Street, Gazey brings all of his great talent to the fore in this production with a performance that is a masterpiece in comic timing. Some of the best scenes in the play are the ones in which the characters learn to dance, climaxing in their stunning end of show strip tease. If you liked the film you will simply love the play, as did the packed house at His Majesty’s Theatre which gave the cast a much-deserved standing ovation. And if you are wondering if the men do indeed go the Full Monty? Well, you will just have to buy a ticket to find out. You won’t be disappointed - it truly is Hot Stuff. The Full Monty runs nightly at 7:30pm until Saturday 23 March at His Majesty’s Theatre, with matinee performances on Thursday, March 21 at 2pm and Saturday, March 23 at 2:30pm. Tickets are still available from the Aberdeen Box Office website.